Snowdonia’s mountains are not to be sniffed at… With 15 peaks over 3000 feet and some extreme winter conditions, they can prove an awesome and somewhat scary place for adventure! Under the careful guidance of the wonderfully patient Andy Teasdale from Plas y Brenin, we took to the icy track up Y Garth, armed with all the essentials for the extremes of a Welsh winter. Ice axes are heavy; crampons, sharp. Water it seems, weighs a tonne. Yet these three, and a lot more besides, are absolutely vital when it comes to putting one foot in front of another. A trek like this underlines just what a difference altitude makes. In just three hours the track went from being rocky to at first icy, then eventually knee deep in snow. In the same time the conditions morphed from being cold but comfortable to being challenging and treacherous. 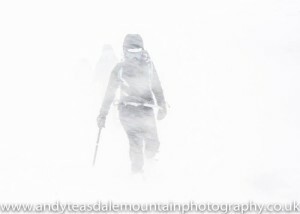 Temperatures plummeted to minus 18 with windchill; whilst a white out and gusts of 75mph made just standing up a real effort. The top of Y Garth was the point of no return. The wind speed and direction made going back the way we came nigh on impossible; and whilst we fought to stay upright, Andy safely guided us along the low point of the ridge (just as windy if not more so than the top) to find shelter. It’s at times like this when you’re battling fatigue; when one of us is *heroically* fighting off a cold; and when you’re literally being swept off your feet that you realise just how dangerous the mountains can be. Staying mentally strong is as much of a battle as staying physically strong, and a hot drink can be the key to unlocking your perseverance. Getting refueled and refocused doesn’t however mean the way back will be easy. The wind speeds we battled with on top of the mountain pushed us nose over crampon all the way down. Icy rocks made for slow progress, but we made it: battered and bruised but euphoric – never have we been so grateful to see the car park and the lift home. We still have a lot to learn, and those conditions would be well above either of our personal capabilities; but when you see that instructors can not only guide in those conditions but take some AWESOME photo’s too, you gain a new found appreciation for the people who understand and know these mountains. This is by no means a comprehensive list of what you need to take on Welsh winter conditions; who knows how much more Andy had to carry to help look after us! Want to visit Snowdonia yourself? The websites of Snowdonia National Park and the National Trust contain a wealth of essential, inspiring information. While the British Mountaineering Council is a superb source of hill walking info and advice.